Tips for every new mom! Preparing for our new baby to come home to our new home was so exciting, but also very overwhelming. I love being prepared so, of course, I registered for all the top baby must-haves to make sure we were ready for anything! My friends and family gifted me so many amazing baby items, so when it came time to finally organize the nursery, we realized we had SO MUCH STUFF. David and I looked at each other and asked, "where is all of this going to go?!" We knew we needed some serious help. Thankfully, I knew two amazing companies that specialize in organization, clearing clutter, and making spaces beautiful and functional. The Container provided a custom closet design plus all of the completion products like storage materials, bins, dividers, etc. to create the nursery closet of our dreams. Additionally, I worked with Organization & Relocation: a team of professional organizers who came to our house to help us get started organizing Ryser's nursery. First, I focused on the closet because the amount of storage available there would dictate what the storage solutions in the rest of the room would look like. I sent the measurements of the nursery's closet along with my storage needs to the design team at The Container Store so they could get started on my Custom Elfa Closet Design. Within a day or two, one of their designers sent us the initial closet proposal. We were able to make changes, like removing a drawer or adding more hanging space, until we were completely satisfied with the design. Once we approved the design, they sent an installer to our home to install the entire system. We didn't have to do a single thing! It was so easy and fast! After the closet was installed, I scheduled an appointment with Organization & Relocation's team of experts to come to our home to set up the rest of the closet and nursery. Before they arrived, they recommended we purchase several different types of decorative bins and drawer organizers from The Container Store, which we did. Next, they asked us to clear the nursery of all products so everything could be sorted first, and then put back in. This first step helped us to see what products we actually needed, what we should get rid of, and what products needed to be moved to a different area of our home. I learned so much from Organization and Relocation so I wanted to share their best nursery organizing tips with you! 1. Be open minded about getting rid of things. Just because your Great Aunt Sue gave you a baby gift does not mean you have to keep it. You have no obligation to keep every single product or gift! If the item is not what you wanted, if you won't use it, if it's a duplicate of something you already have…get rid of it. 2. Start a keepsake box you go through every 6 months to a year. Of course, there will be things that don't have a purpose other than being sentimental! And you should absolutely keep those things - in a keepsake box! Be sure to go through it every 6 months to a year because what is special now may not be special in the future. 3. Store everything in labeled bins. Say yes to bins! 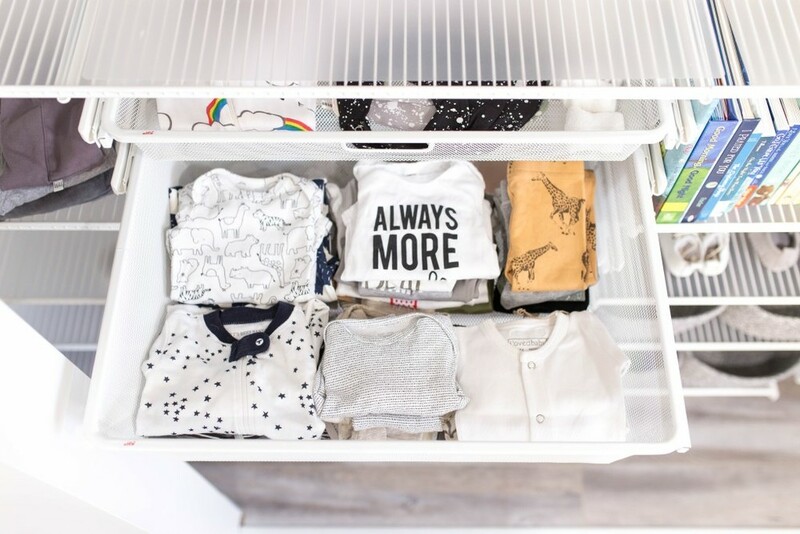 Some baby clothes can be hung and stored in drawers (if you have room), but for the most part, bins are the best storage solution for an open closet. You should be able to see every label when you step into the closet so you're never searching for something. Items that have daily or weekly use should be stored within arm's reach while seasonal items or clothes your baby can't wear yet don't need to be in close reach. We chose to use the Whitewashed Wood Bins in the closet with the White Bin Clip Labels for our space. 4. Dedicate a few bins to future clothes and toys. You know those adorable hand-me-downs and fancy outfits you won't be using for maybe a full year? They don't need to be easily accessible. Store clothes and toys for the future in labeled bins not at immediate reach. You can always move bins around when those items become relevant. 5. Have stock and back stock stored separately. It might seem like a good idea to store your entire supply of an item or product together, but that's a mistake. There are items, especially disposable things like diapers and toiletries, you need immediate access to, but you don't need to have your whole supply within reach all the time. If you have five tubes of baby bum cream in the drawer you're going to open and use all five instead of one at a time. That creates clutter and it's not efficient. Instead, put one tube of cream in the drawer, and keep your back stock in a dedicated bin in the closet. This applies to any product you use but also have a bulk supply of, such as diapers, wipes, etc. 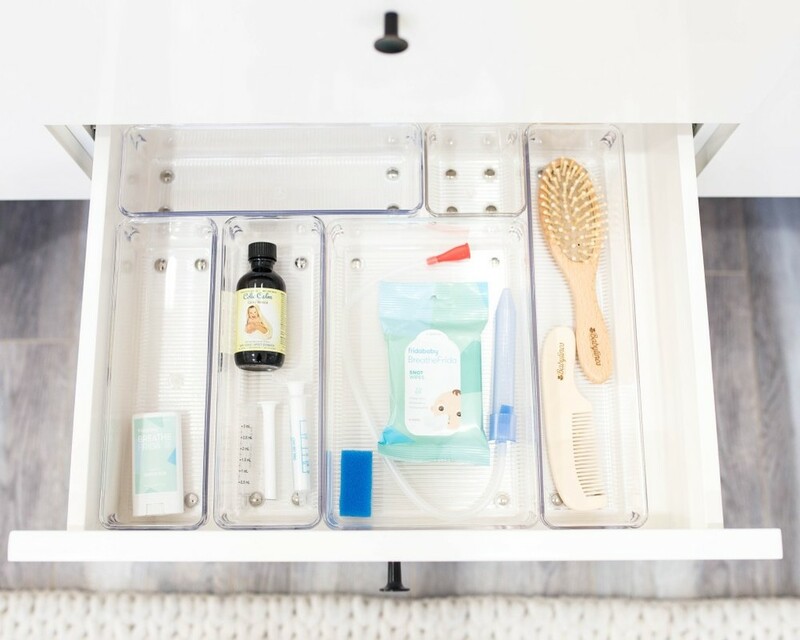 I loved using the Linus Shallow Drawer Organizers for products stored in the changing table drawers and Clear Plastic Storage Bins for bigger items, like diapers. 6. Dedicate space in the kitchen for baby supplies. It's tempting to put all the baby stuff in the nursery so it's out of sight. 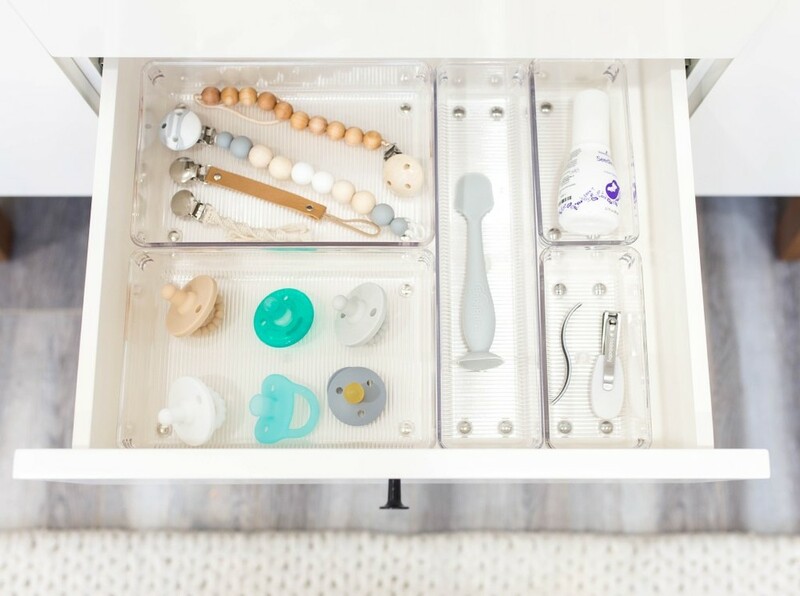 But trust me, you should dedicate at least one drawer or shelf in the kitchen to store baby items. Preparing and storing milk all happens in the kitchen, so your bottles should be easily accessible. There are also a lot of bottle accessories that would be out of place in the nursery. It's also a good idea to keep a space in a cabinet or pantry clear for large, countertop bottle related items, such as drying grass or a bottle warmer. This way you can stash that gear when you want to clear the countertops. 7. Make sure your nursery has a good flow! You've heard about a space having good feng shui, but do you know what it is and why it matters? Following feng shui means the furniture should be arranged in a way that you can walk through the space easily AND safely. 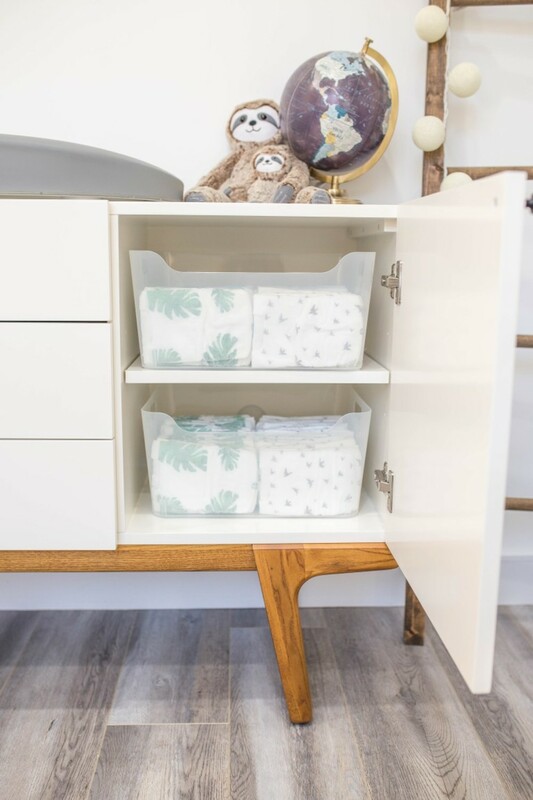 Important items should be in reach at each station: if you are at the changing table, you should be able to easily reach diapers, wipes, bum cream, and the diaper pail. Don't forget safety. The layout should flow so there is no risk of tripping or bumping into anything. Simplify the layout and it will simplify your new mom life. I promise, if you follow these guidelines from Organization and Relocation, you will have the organized nursery of your dreams. Now, all of our baby products have a place: I don't have to search for anything or even go out of my way to grab a product. And The Container Store's fabulous organization products made it all happen! Their Elfa Closet System is strong and customizable, plus they have products to fit any style or space. Working with both the Container Store and Organization & Relocation has made this transition to parenthood SO much easier. Head to my Blog for more tips or follow me on Instagram. An elfa Nursery Transformation Fit for Baby & Co.